Why Do Athletes Choke in Competition? I think athletes choke because they are too worried about results and what will happen if they fail or embarrass themselves. For example, golfers don’t want to get ridiculed for missing a short one on the 18th hole to win the match. Basketball player don’t want to miss a free-throw in the final moments of the game and lose the game. A football kicker doesn’t want to miss a game-winning field goal kick, such as Scott Norwood of the Buffalo Bills in the Super Bowl. When your kick or shot could mean the difference between winning or losing for your team, you might have a greater chance for choking. A research article published in Current Directions in Psychological Science (Association for Psychological Science) examines how choking can be caused when athletes think too much when performing. And certainly I think this is one explanation for choking under pressure. “We think when you’re under pressure, that your attention goes inward naturally. Suddenly it means so much, you want to make sure everything’s working properly,” says Rob Gray, of the University of Birmingham. Athletes who are under pressure often try to do too much to performance well; they think they should try harder or analyze their game more. Thinking too much about a well-learned skill can actually sabotage your performance. 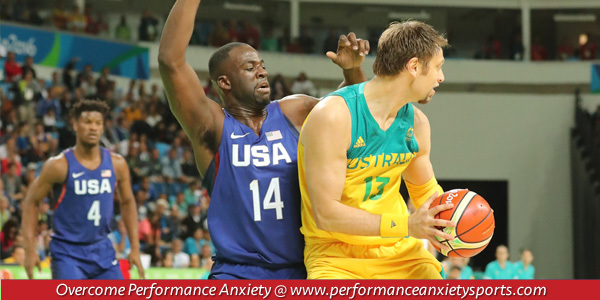 Gray discovered that athletes who choke when they feel under pressure don’t perform as consistently. In baseball, they get less hits that what their stats would indicate. It’s clear that if you feel under pressure, you movements might not feel as fluid or smooth as normal. You might default to over-control, which happens with athletes who have the yips. Over control is the same concept as over thinking your performance. Bottom line: you have to let go of trying harder and trust what you have trained yourself to do in practice.